Sea Turtle Conservation is one of our favorite environmental issues. 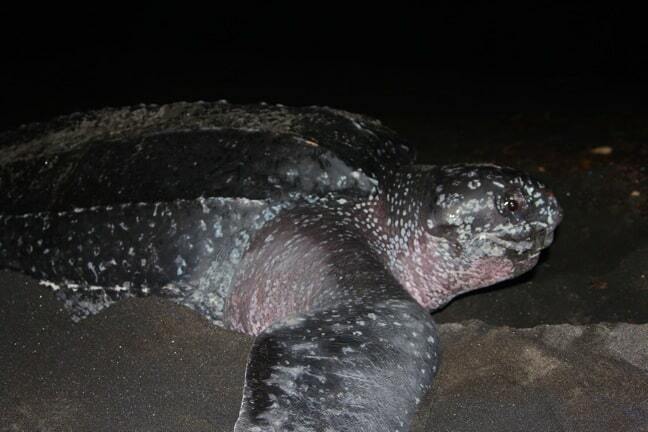 We’ve gone swimming with sea turtles in Barbados, Hawaii, Mexico’s Riviera Maya and the Galapagos Islands. We donate annually to the Georgia Sea Turtle Center on Jekyll Island. And my daughter and I recently got to hand-feed them at the Bermuda Aquarium & Zoo. 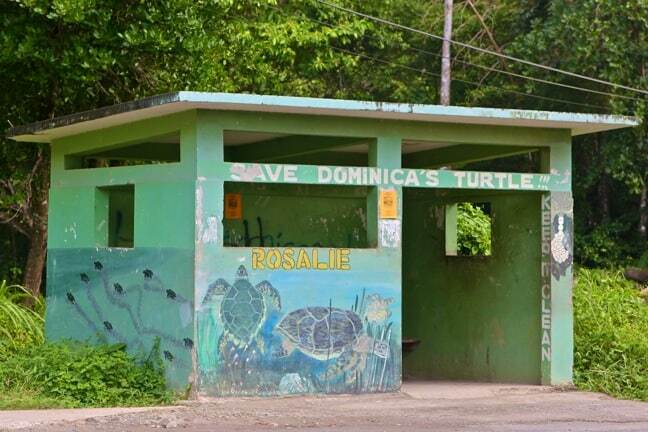 But rarely have we been to any place more passionate about sea turtle conservation than Rosalie Bay Resort on the Caribbean island of Dominica. 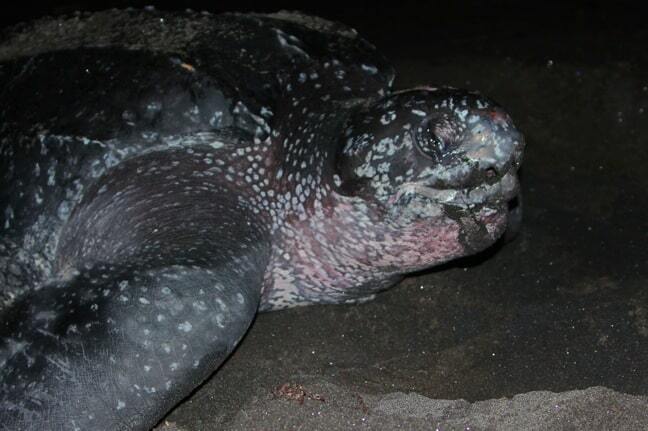 The resort’s conservation efforts began back in 2003, when they launched the Rosalie Sea Turtle Initiative to help protect these endangered species from poachers (who eat both the turtles and their eggs), and they’ve since proven a leading light in the island’s ecotourism efforts. We had just returned from a long, amazing day exploring the island’s Kalinago Territory, and were enjoying an excellent romantic meal at the resort’s Zamaan Restaurant. We were in the middle of a discussion on whether or not to have dessert when the restaurant’s phone rang. Our server immediately rushed over to us and explained that a sea turtle had been sighted on the resort’s beach and was digging a nest, asking if we’d like to go see it (the resort staff asks when you check in if you’d like to be notified when turtles come ashore). Of course we said yes, so our server grabbed his cell phone flashlight and led us down the rock-strewn path that led to the beach. 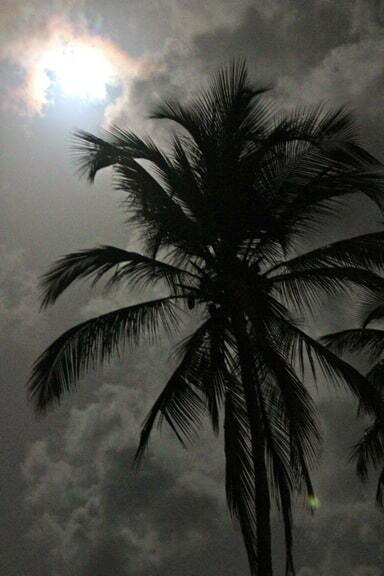 Honestly, we probably could’ve have found our own way, as there was a gorgeous full moon illuminating the shoreline. As I mentioned, we’ve had a LOT of experience with sea turtles. 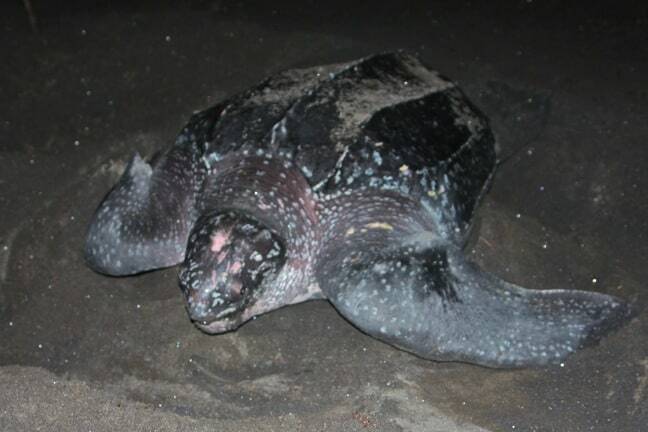 But nothing could’ve prepared us for the sight that greeted our eyes as Nature Enhancement Team leader Simon George waved us over with a tiny red LED flashlight: A 1000-pound female leatherback turtle about to give birth! 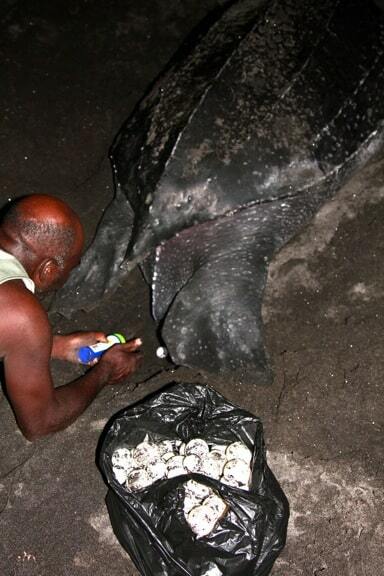 At this point, it must be noted that you should NEVER use white lights or flash photography when nesting turtles are around. Simon, who knew we were there as journalists covering Dominica’s ecotourism initiatives for numerous publications, specifically asked us to document the event for our readers to help educate them about the island’s sea turtle conservation efforts. 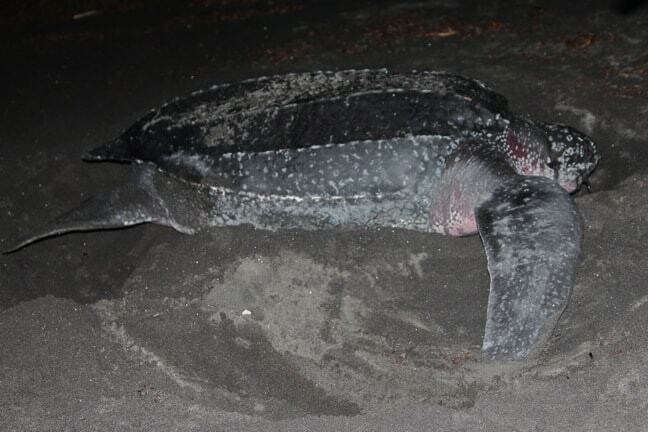 Simon explained that the turtle had come up on the beach around 7PM, gradually making her way to a high point on the black sand beach and using her massive back flippers to dig a hole approximately 12 inches across and 18 inches down. 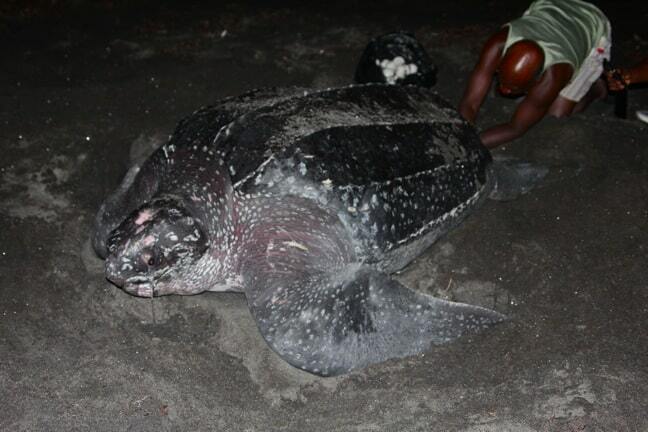 Simon and his assistant, a fellow volunteer from the local community, took the turtle’s measurements– nearly 6 feet for the carapace, or shell, not including her feet and head. As Simon notated the turtle’s size and distinguishing marks in a journal, we watched her settling into place, and could barely contain our excitement as she began squeezing out 2-3 shiny white eggs at a time! At Simon’s urging, I began snapping photos like crazy, eager to document every moment of this unbelievable experience. This photo shows just how massive this turtle mama was in comparison to Simon’s assistant– easily a foot taller and 5 times the girth. As the eggs began dropping, the volunteer got into position, gathering them up by the handful and putting them into a bag so that they can later be moved further up the beach, above the high water line. Otherwise, as the tide rises, the eggs would be washed out to sea. In the course of an hour, she dropped more than 100 eggs, each of them about halfway between the size of a ping pong ball and a tennis ball. There were also a few smaller cushioning “spacer” eggs, which Simon explained contain only yolk and help to prevent the other eggs from getting crushed. When I expressed concern that my camera’s flash might interfere with the process and disturb the mama turtle, Simon explained that, once they start laying eggs, turtles enter a trance-like state, during which they seem oblivious to anything else going on around them. Sure enough, she remained virtually motionless during the egg-laying process, never turning her head as she focused intently on the task at hand. 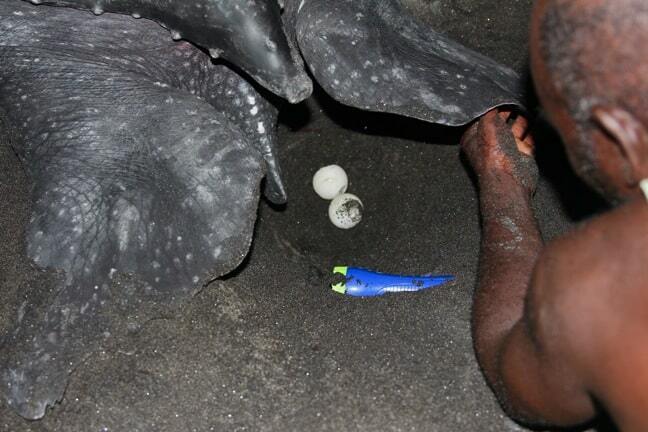 After squeezing out enough eggs to fill the bag, mama turtle rested for a few minutes before slowly starting to move. Easing a few steps forward, she began to use her huge front flippers to propel sand back towards the hole. Simon explained that she was filling it in to disguise the hole, and that this was just the first step in what would prove to be an elaborate camouflaging process designed to hide her babies from predators. Making A Sand Angel & Camouflaging Her Nest At The Same Time= WIN! Gradually, the mama turtle moved her monolithic form in a complete 360˚ circle around her nest, replicating the cover-up process over and over again. In the process of covering the spot where her babies would’ve been, she also covered herself and all of the volunteers and onlookers present, leaving us laughing hysterically. We get out of the way and renew our conversation with Simon, only to find her rotating and flipping sand nearly 20 yards in our direction! 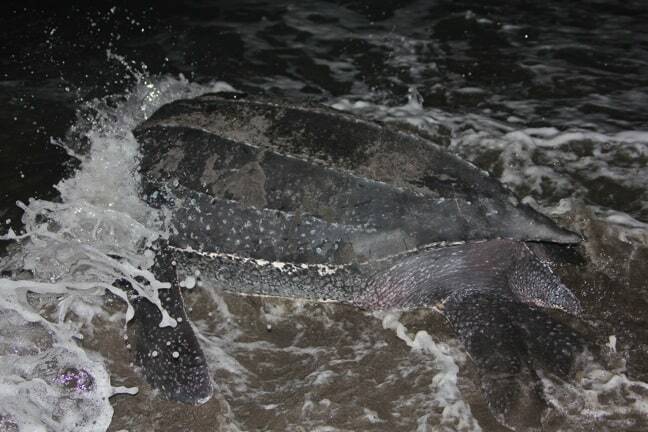 But the results were incredible, as soon it was nearly impossible to tell that a 1000-pound sea turtle had been in the area at all. After she’d finished with her work, mama turtle gradually made her way back towards the sea, huffing and puffing from her exertion every step of the way. We could tell that she was thoroughly exhausted, and we quietly cheered her on as she would heave her heavy body a few steps forward, stop to rest for a few seconds, then take another few steps towards the surf. I walked beside her every step of the way, so intent on capturing the scene that I forgot I still had shoes on, kicking them off just in time to snap this shot as she finally reached the water. The moment was absolutely exhilarating– one of the coolest wildlife encounters we’ve ever had! The next day, we walked down in the daylight to get a better look at Rosalie Bay’s Sea Turtle Hatchery, which is located on the other side of a 20-foot wide tidepool inlet that crosses the resort’s beach. Here, a simple camp made from plastic tarps and cardboard box-covered pallets provides shelter for the volunteers, who work from the early evening until morning, watching for turtles and keeping the beach clear of debris that would prevent baby turtles from reaching the sea. They also bury the turtle eggs in garden-like marked rows, noting the anticipated hatch day and cordoning the area off to protect it from poachers. 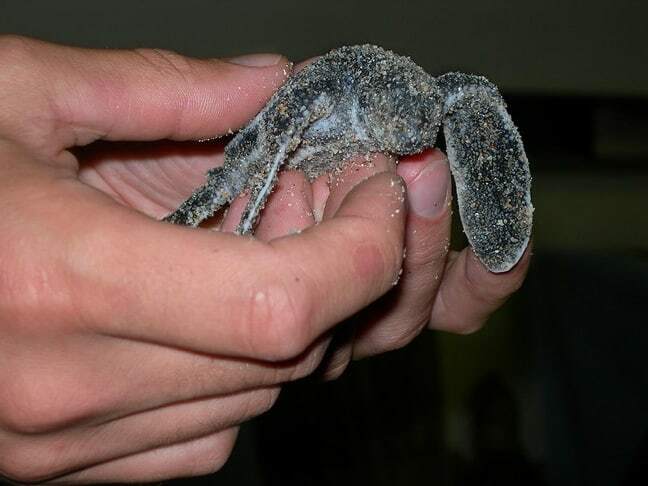 When it’s time for the turtles to hatch, resort staff, travelers and members of the volunteer community all come out to watch, helping to ensure that the baby turtles reach the sea safely.